JL: My research is kind of divided into two parts. I do ground-based work where I basically deploy computer-controlled radios to listen for radio signals coming from near-earth space. Again, the most interesting regions are the Arctic regions where the northern lights occur. The northern and southern lights are responsible for a lot of the radio emissions that we observe coming from near-earth space. Half of my research involves deploying arrays of antennas at various locations in the Arctic and Antarctic to listen for signals coming from space. For the other half of my research, we basically take these same receivers and make compact versions that you can put on a rocket and launch into space. NASA makes opportunities for university researchers to get to put their instruments on rockets, so every two or three years we get to put some of our receivers and antennas on rockets, launch them up into the Aurora and get measurements right in the Aurora where the radio signals are being generated. Why do space exploration and research matter today? JL: One of the main elements that is driving this field of research is the effort to essentially predict the weather in space the way we currently predict the weather in the atmosphere. This is of great importance because of our reliance on GPS communication satellites in space. These satellites can be affected by weather conditions in outer space, so there’s a big push to try to be able to predict what the conditions are in space for two reasons. First, if we know that some adverse space weather event is going to happen, sometimes satellite operators can take mitigating actions to protect their satellites. The other thing is that by knowing the range and kind of space weather that can occur in these satellite environments, you can better design the satellites if you know what kind of environment they’re going to encounter. It can save money in terms of how the satellites are built. Our research on different things eventually folds into this picture of trying to understand and be able to predict the weather in space. We are not yet at the point where we can predict the weather in space nearly as well as we can predict it here on the surface of the earth. Besides your work, what are some interests or hobbies you have that most students don’t know about? JL: Like most people here in the Upper Valley, I get outside a lot. I do a lot of biking, skiing, cross-country skiing and hiking. Those three sports take a lot of my time and are my main hobbies in-season. A lot of students will find me at Dartmouth’s cross-country ski center Oak Hill quite a bit. I also travel a lot both for my work and for adventure travel, so I’d say that that’s a hobby. What is one of your favorite teaching memories from your time at Dartmouth? JL: One of my favorites is that every year for Physics 14, “Introductory Physics II,” I always give the last lecture on the theory of relativity. I just had a haircut, and in fact I just timed this haircut because I know that I’m going to be teaching Physics 14 this spring. What I do is time my haircuts so that my hair grows out by the end of Physics 14 for the relativity lecture. Then I can actually do a pretty good Einstein with my long hair! I have gray-white hair and it flares out, and you’ll notice I have some hair spray over there. Every time I teach Physics 14, I try to work in an Einstein lecture, and that’s always a lot of fun. 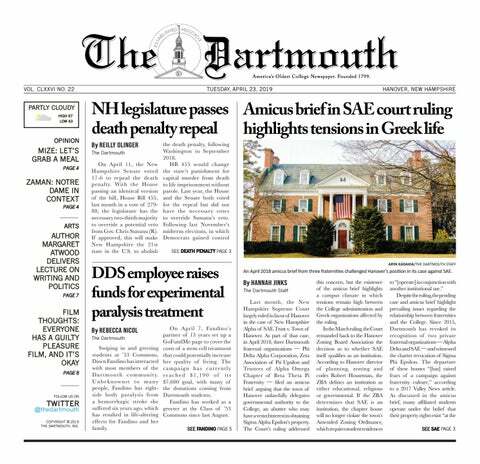 Dartmouth recently regained its “R1” classification as a research institution after losing it in 2015. Have you noticed any changes over the last few years regarding the College’s support of your research? JL: I haven’t noticed any local changes, but it is something that we care about quite a bit. I’m very happy that the administration was able to do whatever was necessary to check the various boxes to get us back to “R1” status. It heightens our visibility in the research world and ultimately helps us get external resources and attract graduate students. We all consider it to be an important status to have. If you don’t have “R1” status for a year or two it’s probably not that big of a deal, but had we not had “R1” status for a decade or two, that would have made a big dent and started impacting us. I think lapsing for a couple of years didn’t really have that big an impact, but it’s great that we were able to get it back.